I have been haunted by an unsettled feeling the past two months. We have lived in our neighborhood for over two years now. We know our neighbors, although not as well as we should. There are 70 some houses in our subdivision. It is small and consists of one outer road circling an interior road and a cul-de-sac. I have mapped out the homes of most of our closest neighbors so that I can remember their names. Last week was Halloween, our third in this house. This is the only day of the year we see people outside of their homes except for the occasional evening walkers. Our boys dressed in their costumes and my wife and I followed them as they collected candy. We use this as an opportunity to get to know people a little better, stopping to converse with those who have set up shop in their driveway. I attempt to memorize names, writing them down on our map as soon as we return home. Luckily, this year’s holiday was followed, three days later, by a picnic for the entire subdivision. On Sunday, my family carried our lawn chairs and a dessert (seven layer cookies that didn’t make it back home with us) to the cul-de-sac where we saw all of our neighbors in the daylight. This was the first event sponsored by our homeowners association since we moved in. I was really looking forward to connecting with more of the people in our neighborhood. It worked. I met Kristin (probably for the fourth time). I met Rob and Melissa for the first time. I said “hi” to Lindy and Morgan and Erin (our neighbors on either side of our house). I was feeling pretty good. I want so desperately to be a good neighbor. So, the picnic helped. 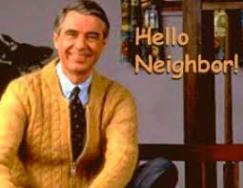 Usually, I feel like a bad neighbor. When we first moved in, I met the guy across the street (I forgot his name before I could write it down on my map). He and his wife were in their late 60s or early 70s. He was a bit cantankerous. In our first conversation he informed he his grandfather invented the cardboard box in Chicago at the turn of the century before last. When I told him I ironically had several dozen empty cardboard boxes in our living room (left over from the move) he said I should sell them on ebay. He failed to appreciate the irony. When I told him I worked for a church, he told me that he was an atheist and his wife was Jewish. Hmm. Maybe I failed to appreciate the irony here. He told me I would probably like his neighbors since Paul and Cheryl are Christian. I told him I liked him fine the way he was. He also told me his wife was recovering from surgery and they both had some form of cancer, although it didn’t sound imminently life threatening for either of them given the matter-of-fact manner with which he shared the information. Later I found out he was not well thought of in our community. He had two full size garages that housed a motorcycle and four souped up cars on which he liked to work. He told me he built one car from scratch. It was rumored (though I was never a witness to this) that he liked to drive fast down our tiny street, endangering everyone on foot. The condition of his house added to his reputation. Evidently, it was never properly finished. The eves and the flashing were conspicuously absent. However, the interiors of the garages were finished with a coat of bright yellow paint which one could easily pick up from the street, much like a Thomas Kinkade painting, although not as subtle. In our two plus years, I have enjoyed his gruff and direct approach to life. It was somewhat refreshing. He has been helpful. He helped me tune my lawnmower, lent me a couple of tools and always struck up conversation from across the street when I was getting my mail or taking the trash to the curb. This last spring he began sprucing up the outside of his house, finishing off the fascia boards with copper trim and guttering. This summer he repaved his driveway and was in the process of reworking the landscaping. In late August, a church friend of ours in our subdivision asked us if we heard that our neighbor across the street died. I went directly into denial. This can’t be true. I talked with his wife within the last ten days and she didn’t say anything. I had asked her if she had any leftover pavers from their driveway project. Evidently, he was in a motorcycle accident two weeks earlier, leaving him in a coma from which he didn’t recover. Once we verified his death, we looked for her. The house had grown dark. I remember seeing somebody pick her up several days earlier and I haven’t seen her since. The house is still dark. Every day I look across the street and wish I would have been a better neighbor. Did I ask her for pavers at a time when I should have been asking about her husband? Who was taking care of her and her daily needs? Why couldn’t the neighborhood have been a more functional support for her? Sunday was All Saints Day, where we remember those that have died in the past year. In our Christian tradition, we remember those that have lived a life exemplifying our faith in Jesus. As we walked out the front door to go to our neighborhood picnic, I recalled, instead, my rough-around-the-edges, atheist neighbor across the street. I suspect Jesus loves him, too.